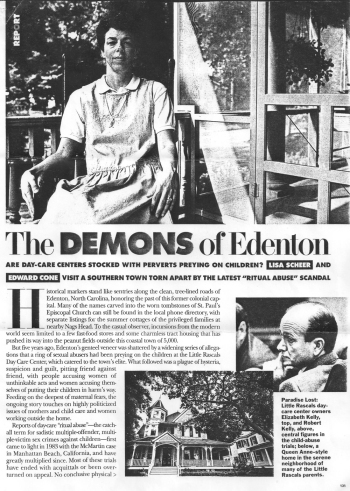 On April 14, 1989, the first arrests were made in Edenton in what would become known as the Little Rascals Day Care case. The case came amidst a nationwide flurry of prosecutions of daycare workers for alleged “satanic ritual abuse” of children. Twenty-nine students at the Little Rascals center accused 20 adults, including Edenton’s mayor and the sheriff of Chowan County, with 429 instances of sexual and physical abuse over a three-year period. The children’s’ descriptions of the incidents were mind-bending. Some described incidents as involving space ships, hot air balloons, pirate ships and trained sharks. As in other similar cases from across the country, the children’s stories were concocted through sessions with investigators and therapists, many of whom used leading and suggestive questioning techniques. Prosecutors did not produce evidence or eyewitnesses. Today social scientists consider the scandal a “moral panic,” and it has been compared to a witch hunt. In the most notorious of the Little Rascals trials, the defendant was convicted of 99 indictments and sentenced to 12 consecutive life terms in prison. The court of appeals overturned the convictions of all seven defendants in 1995. The Little Rascals case is said to have been the state’s longest and costliest criminal trial. The PBS program Frontline aired a series of programs on the case and still maintains a website with a variety of materials related to it..